Hey guys, where the heck was that yesterday? Or the last two weeks? John Maine chose his most important start of the year to pitch the game of his life, becoming another in a long line of Mets hurlers to come very close to a no-hitter but falling just short. He pitched 7 2/3 innings, struck out 14, and allowed one dinky hit, two walks, and zero runs. Stealing some of the thunder of that performance was the Mets offense, which exploded for over a dozen runs. Jose Reyes remained absent early in the game, but two-hitter Luis Castillo took ownership of sparking the offense from the top of the order. The Mets’ next-best table setter followed a first-inning Reyes flyout with a drive off the top of the left-center wall for a double. David Wright hit a single to right to chase Castillo to third, and after Carlos Beltran ripped a hot liner into the glove of Miguel Cabrera, Moises Alou picked him up with a base hit into center to drive in Castillo with the first run of the game and send Wright to third. But the Mets weren’t done, as Carlos Delgado also singled up the middle to score Wright. In the second frame, Lastings Milledge led off by working the count full against starter Chris Seddon, then ripped a single to left. He was sacrificed to second by John Maine, and took third on a lazy groundout to the right side by Reyes. Castillo singled Milledge in for the third run of the game, and Wright walked to put men on first and second. Beltran belted another ball, but this time it found a hole, scoring Castillo, chasing Wright to third and sending Seddon to the showers. Reliever Ross Wolf was greeted with another single by Moises Alou to make the score 5-0. Wolf wasn’t any better the next inning, giving up a leadoff single to Ramon Castro and a two-run homer to Milledge. Maine walked, and Reyes chopped a ball off the plate that catcher Miguel Olivo fielded in fair territory — but Reyes inexplicably stood at the plate, and Olivo made an easy throw to first for the first out. Castillo followed with a double down the leftfield line to score Maine, making the score 8-0 and sending another Fish pitcher to the frying pan. Milledge jumped all over another fastball in the fifth and sent it to nearly the same spot as his last blast, making the score 9-zip. After Maine struck out and Reyes doubled, Marlins pitcher Harvey Garcia threw two pitches behind Castillo, nearly causing a brawl. Order was restored and Castillo walked, but while Fish manager Fredi Gonzalez was pulling a double-switch, Miguel Olivo charged Reyes at third base and all hell broke loose. The entire Mets team rushed onto the field, and looked like a massive offensive line pushing against the Marlins. Mike DiFelice was cracking heads all over the place, and it took five Fish to hold him back. 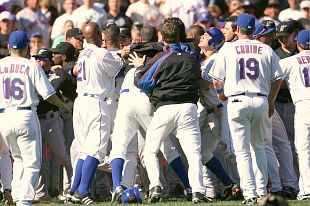 Even the mild mannered Carlos Delgado was in the middle of the rhubarb, pushing and shoving like a hardened rush-hour commuter on the #7 train. By the time it was all over, Olivo was tossed, Reyes remained in the game, and LMillz hadn’t capped anyone. When play presumed, Wright singled in Reyes for the Mets’ tenth run of the game. A few minutes later, John Maine took the mound after a long, long break, and would have been excused if he wasn’t sharp. However, there was nothing to be concerned about — he blew through three Fish, striking out the first two and nearly striking out the third. In the bottom of the sixth, the Mets tacked on another run, thanks to a (surprise) a solo homer by Ramon Castro. They added yet another when Delgado drove in Wright with a single in the seventh. In the top of the eighth, John Maine set down the first two Fish (one by strikeout) before backup catcher Paul Hoover — who had replaced the ejected Olivo — hit a slow bouncer about thirty feet down the third base line that Wright could do nothing with. The infield single broke up the no-hitter and took Maine out of the game — who had thrown 115 pitches. Willie Collazo came on to get the third out. But the Mets still weren’t done … they scored another run in the bottom of the 8th on a double by David Newhan, who pinch-hit for Wright. Carlos Muniz pitched a perfect ninth to end the most exciting game of the last two months. I think I’ve figured out John Maine’s inconsistency. He’s over-rotating just slightly when he lifts his leg, which is turning his shoulder about 2-3 inches too much toward second base, and because for every action there is an equal and opposite reaction, it is causing that same shoulder to fly open toward home plate too early. That’s why his right arm is dragging across and his release point is up, and the pitches are going up and away to lefties. It’s a slight mechanical error, and he doesn’t do it every pitch, but it’s enough to mess with his control. It’s also going to cause his slider to flatten out. I don’t know that it is something that can be corrected in-game — you don’t really want a pitcher to be thinking about mechanics while in competition. But if he can correct it over the winter / during spring training, he should get back to being the pitcher he was in the first few months of 2007. And yes, I did see that he struck out 14 Fish and nearly threw a no-no. However, he did not have great command of his fastball, and was helped a bit by the Marlins swinging at pitches out of the zone. Reyes is completely burnt. Someone needs to beat him over the head and scream “RUN! every time you hit the ball, don’t look, just turn toward first and RUN!” The kid is a mess. However, his emotional outburst during the fifth-inning fracas may have been helpful — I think he’s had a lot of bottled up, negative emotion over the past month or so, and needed to get some of it out. Frustrating to see Marcos Carvajal pitching for the Fish. It wasn’t bad enough that Florida turned Matt Lindstrom and Henry Owens into MLB relievers, but they had to claim Carvajal — another guy who throws north of 95 MPH — as well. Granted, in a million years Willie would never have trusted any of the three, but it still stings to see these electric arms throwing pitches in big league games — especially when the Mets dropped Carvajal to make room for the likes of Brian Lawrence, Sandy Alomar, and Aaron Sele. Why they didn’t simply put Easley or Valentin on the 60-day, no one knows. The last game of the regular season takes place at 1:10 PM at Shea. Tom Glavine goes against Dontrelle Willis in what could be the most important game of the season — unfortunately, it will all depend on what happens with the Phillies tonight and tomorrow. Reyes is toast. However, if the Mets get there . . .
Yeah, he does, and he damn near had to. 7 2/3rds. They dearly needed this from Maine. ugh … a cheap squib by a backup catcher. The win and bloated run total is still masking larger underlying issues with this team. Today, they won big but did it in spite of more glaring mental mistakes. And when the offense isn’t facing a steady dose of batting practice pitching, and a pitcher isn’t throwing 7.2 innings of no-hit ball, the Mets are going to keep losing making these mistakes. 2. He never learns from mistakes and instead constantly butts head with management as to “his style” of play against “their style.” His style being run-until-you’re-dead and play hard when you feel like it. Their style being fundamentally sound and putting the team ahead of yourself. As for Sunday’s game, obviously the Mets really need to win. They can lose and still possibly make the playoffs, but that’s asking the Phillies to lose 3 games in a row (twice to Washington, and then to us in a 1-game playoff). What do you see as the more likely scenario? B) The offense keeps rolling, Glavine goes 7 effective innings, and the bullpen figures out how to hold a lead in a big game. You be the judge. You all know my answer. on the average hit a lot of home runs considering how few times willie let’s him start. i think he is a good luck charm, really something peaceful and unflappable about him. we need that. A. difference in the game: lastings Milledge…..not endy who WOULD have played there if he had been available to willie…..
Other difference: Maine again a 2nd yr pitcher. b. charlie Manuel: Fired by the Soxx because he let the Yanks come back from a 3-2 deficit in the playoffs: Again Willie gets to hide behind this offensive juggernaut too often. the ‘little’ losses the poor tactical moves are now magnified. b3. Manny Acta is doing fine. So dont blame the assistants. b4. Kharma: Willie was on that 1993 Mets team. the surprise for Castro was facetious … all he DOES is hit HRs when he starts! glad to see there is Castro love. he is consistently amazing and should be someone’s starting catcher I would think. joe, i should have realized the irony, but was clearly caught up in the emotions yesterday, reading too fast.